To continue my Easter report. I’ve already told about the drive to Bundaberg. Then I shared what we did on Good Friday. I thought I’d better finish the tale about Easter before Christmas is here. Easter’s Eve we decided to visit my Dad’s farms within the area. It was a good chance to catch up with staff we haven’t seen in quiet some time, check out some new equipment in the sheds and see a new variety of cucumber in the greenhouses. The triplets first perusal of the farms and packing sheds. In the afternoon I hung out with my BFF again. This time we went with my parents and sister to her parent’s house for afternoon tea. Our families grew up together, so it was lovely to catch up with everyone. 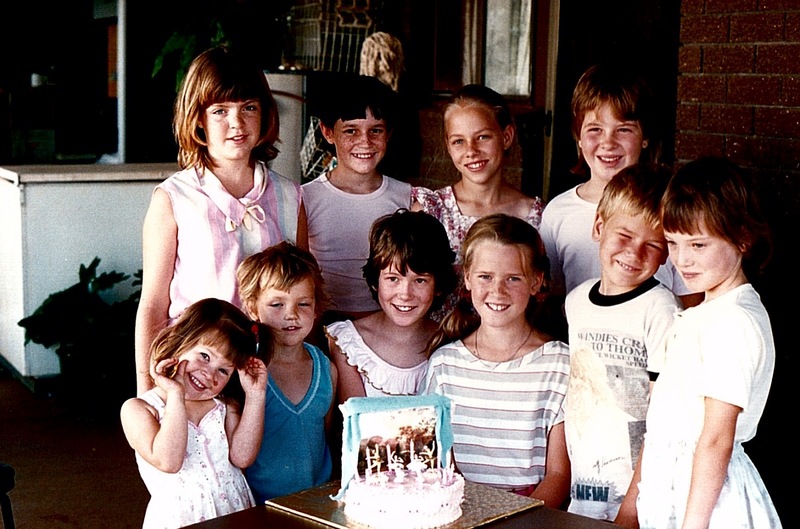 Flashback: Hanging out with Kylie and some friends at my 10th birthday party. Current day: Still friends – despite wrinkles! There’s always a special bond with old friends. There’s years of stories tucked away that make you laugh. So that’s exactly what our Mums did. 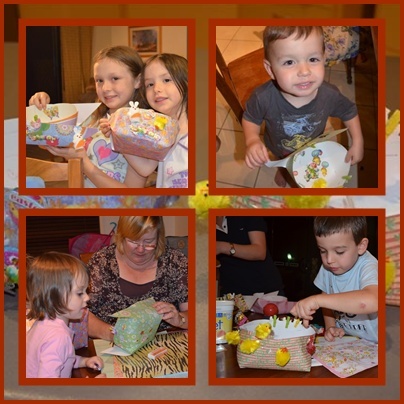 That evening with a rich sense of expectancy, the kids sat down with Grandma and made Easter baskets so the Easter bunny had somewhere to deliver his sugar laden treats. They were only simple, made with pretty paper and fun stickers and adorned with little chicks. The kids loved it and I know these are the little simple things can create great memories. Of course the bunny did deliver. To be truthful, as much as I would have liked to, I didn’t hang around to see the children discover their full baskets. I chose sleep. Alex was up, there were lots of people around to hold babies, and I had finished feeding in the early hours of the morning, so I kept sleeping. It was lovely. By the time I awoke, much chocolate had been consumed and The Pocket Rocket was just starting on a giant choc rabbit. Look at her. She’s already tipsy from chocolate. My little trio also enjoyed their first Easter. They got into the bunny groove and totally rocked their ears. tar would be upset, he left in a rather grumpy mood. He’d been partying too much with his cousins in the backyard tent the night before. Somebody had to pay. As it turned out, my Mummy radar was in total girl mode. The boys were having the time of their life. Their cousin was rather jealous watching them return home. Rain to boys. It increases the adventure. On our final day we rushed around throughout the morning packing up. It was a good thing that the rest of the crew left a week after us. That way they could retrieve and return the myriads of things I still managed to leave behind. 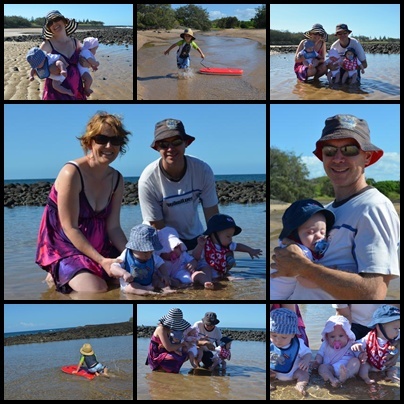 We did manage to take the triplets to the beach before leaving. Didn’t seem right to be staying across the road from a beach and depriving their first visit. So cute. They didn’t mind sand between their toes and having a splash in the water. Poor old T-star didn’t make it. He was catching some serious zzzz’s thanks to another night in the tent. I’m just thankful that the triplets and I stayed inside. From all reports T-star made his way to the parental air mattress and proceeded to wiggle every which way and sleep on every angle, all the while the air mattress slowly decreased in volume. The trip home went smoothly. I did feed two babies with my arm stretched behind reaching into their capsules with the bottles. But they coped admirably, accepted the milk and pushed on. Little troopers. That way we only had to stop to breastfeed one baby and change them into warmer clothes as we approached our cooler climate, and there was one other stop to change a nappy. Awesome effort. It was wonderful getting out of the house. Truly wonderful. Sometimes it really is worth the risk of doing crazy things like travelling with multiples. It’s even more of a pleasant experience when it’s better than expected. So, can you remember way back to Easter? What did you do? Lovely post Caitlin, about old friends and the ties that bind us. Hmmm Let me see! Held Babies! Made Easter nests with Grandchildren! Cooked! Cleaned! 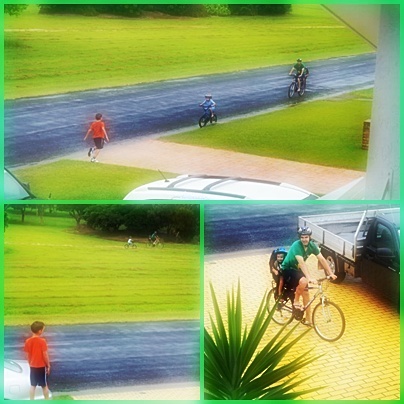 Listened to Grandchildren camping in Back Yard! Had a family Easter.